I love the area that I live in. At night you can see all of the beautiful stars in the sky. It's one of the perks of living in the outskirts of the city. However, because of this, it's always good to have a light that can illuminate your yard the second someone sets foot on your property. I have a couple of sensor lights in place, but this new one from HuiSmart is almost double their size! It is solar powered, so it simply needs to sit in the bright sun all day, with nothing complicated added on. Just install it somewhere you know the sun will be shining down on for hours. There is a little button on the back that you need to push to turn it on. It comes with the screws and mounting brackets, which work fine. We had some screws already on a nearby wall, so I used mine instead. 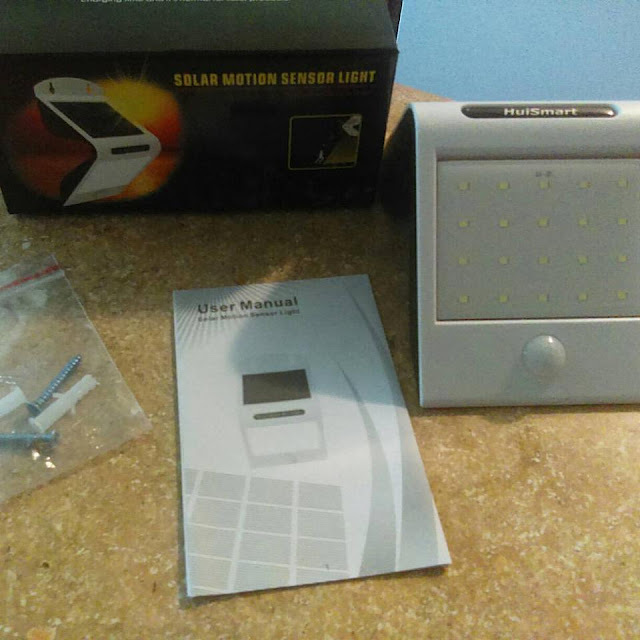 It has an auto on/off feature, as well as a dim or bright light setting. The higher up you put this light, the bigger the light range will be able to reach. I like that of course. 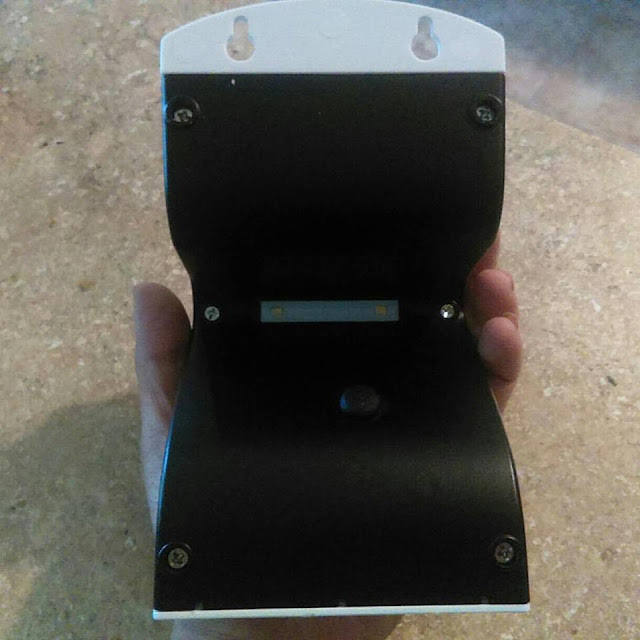 The light has a small light on the back that turns on once it is night time. It's not bright at all, just a little tiny bit of light. 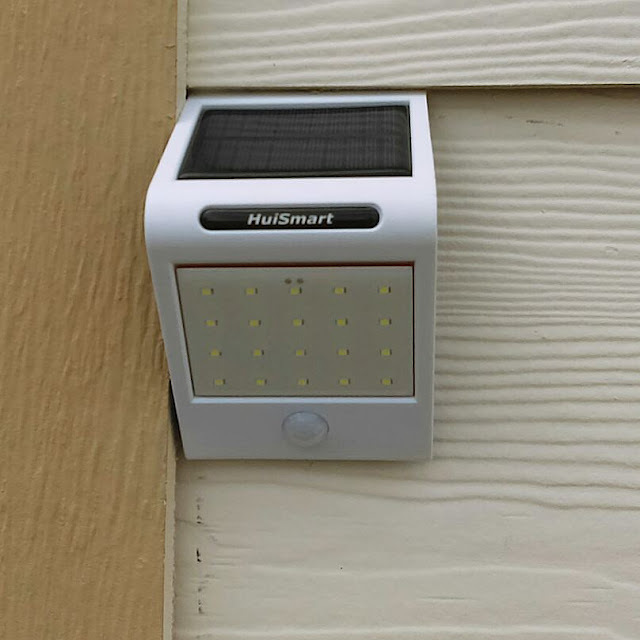 However, when someone or something passes this light's sensor, the light is very bright. It stays on for a few minutes too. Of course I want to know if anyone or any wild animal is lurking in my yard at all hours of the night. It makes me feel more safe in my home. I also like it for when we get home late and might have forgotten to leave the porch light on. It's a very nice product. I forgot to add---it's also waterproof!